Khabib Nurmagomedov will not be stripped of his UFC lightweight title despite his role in a post-match brawl Saturday, UFC president Dana White said in a website posting Tuesday. The 30-year-old Russian kept his crown with a fourth-round submission victory over Conor McGregor in Las Vegas, improving to 27-0 in his professional career. Nurmagomedov had barely released his hold after McGregor tapped out when he launched himself over the Octagon fence, apparently targeting McGregor’s training partner, Dillon Danis, as security tried to quell the chaos in the crowd. 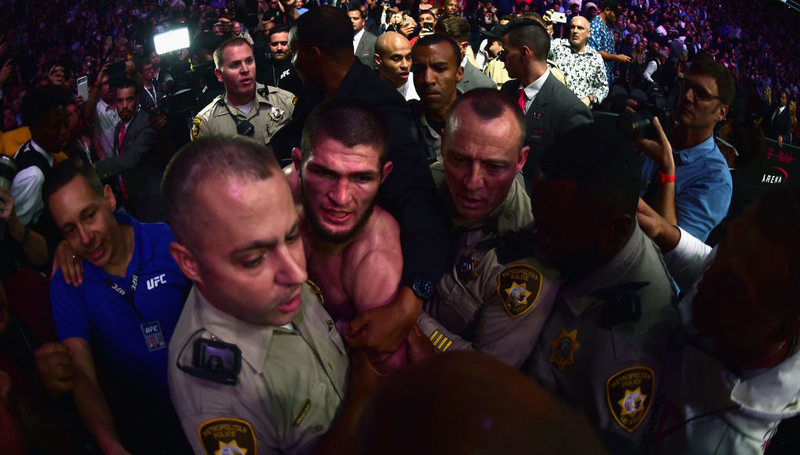 Nurmagomedov was hustled out surrounded by security officers as a pro-McGregor crowd jeered and threw drinks at him. While UFC president Dana White did not present Nurmagomedov the title belt, fearing arousing the crowd’s ire, he told TMZ in video posted on the UFC website that the Russian would not be stripped of the title and any punishment for the melee after UFC 229 would likely come from the Nevada Athletic Commission (NAC) and not UFC. White said he thought the NAC should take a $250,000 fine. UFC president Dana White made the following two statements when talking about separate incidents. Can you guess what he’s talking about in each? Here’s a clue. In one, he later exploited footage from the “disgusting” incident to promote the biggest and most important fight in the company’s history. And the other? What the future holds in the aftermath of White’s comments made following Saturday’s UFC 229 melee remains to be seen, but given past precedent, we can reasonably expect similar treatment. Indeed, White will publicly chastise Conor McGregor for slamming a dolly through a bus window and also Khabib Nurmagomedov for inciting a riot, yet it is difficult to decipher which dollar signs were flickering faster, the ones inside the Las Vegas hotels or the ones inside his head. Welcome to the modern UFC, a company now built upon a heap of trash through the mountain of uncontrollable egos. White, and the UFC, alongside Nurmagomedov and McGregor are apportioned blame for the abhorrent scenes which took place in the immediate aftermath of the Dagestanian’s fourth-round submission victory in the 155lbs title fight. They have bred this culture of boundary-pushing trash talk, rewarding those who sell their fights through words and neglecting those who do so through their actions. It’s all about moving the “needle” and by ignoring rankings, abandoning athletic endeavour to instead opt for what makes the most money, the UFC picked their side long ago when the entertainment-or-sport debate emerged. And whether fans like it or not, this is what the UFC is all about now, the ugly scenes of Saturday a predictable side effect when you celebrate rather than punish “disgusting” episodes. Indeed, how can you as an organisation glorify obscene actions and then not expect the absolute worst to follow thereafter? The McGregor Brooklyn bus attack and Nurmagomedov’s jumping out of the cage while his team jump on the divisive Irishman are not one and the same, but they are products of an identical cause. Criticising one is not to absolve the other, but let’s be absolutely honest here because the fans also play their part in feeding the beast. There can be absolutely no doubt a rematch will be even bigger with even more fans invested emotionally and financially. The world was indeed watching on Saturday, and now they’re all talking on Sunday. Regardless of whether the conversation involves people using this an opportunity to virtue signal or not, all publicity is good publicity when you’re in it for the money and not the morality. Again, this is not to completely absolve those involved of blame. Quite the opposite, it is to spotlight their actions and use it to discuss the wider issue because this is a classic case of cause and effect. Nurmagomedov should be stripped but likely won’t be given White’s leniency of McGregor in April. The undefeated and undisputed champion may opt to retire after the biggest pay day of his career, yet there is too much money to be made in a second fight. The dust will inevitably settle, the dirt dug back up and we’ll all be tuning in to with hopeful eyes to see if any more mud will be spread across the Octagon canvas when these two meet again. This is after all, what entertainment is about. 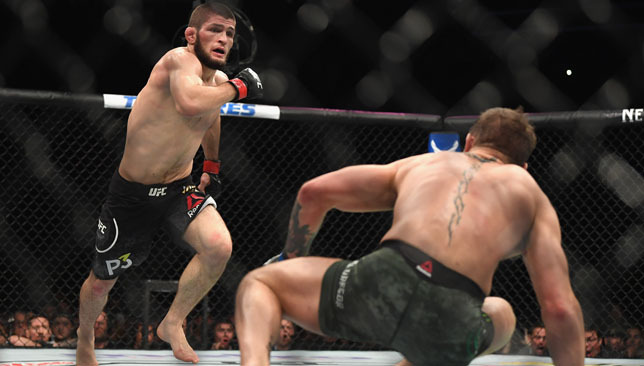 Khabib Nurmagomedov apologised for instigating a brawl following his stunning defeat of Conor McGregor at UFC 229. 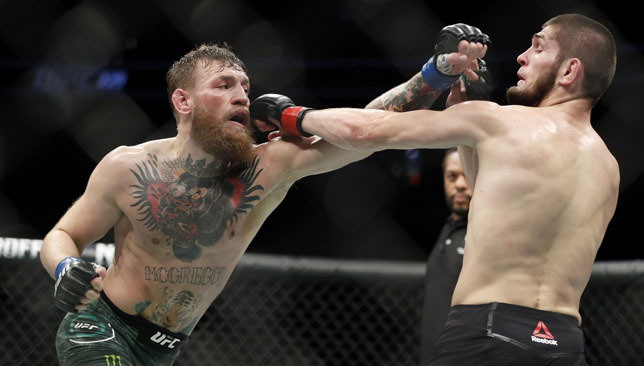 McGregor’s mixed martial arts return after a near two-year hiatus fell flat as he tapped out midway through the fourth round, but Nurmagomedov soured a career-best performance with his actions immediately afterwards. The Russian, whose victory meant he retained his lightweight title, threw his gumshield, vaulted the cage and attacked someone from McGregor’s camp. Nurmagomedov expressed his regret at what had unfolded but showed his disdain for McGregor’s behaviour leading up to the fight, including the notorious bus attack in April that left several rival fighters injured. The 30-year-old said: “First of all I want to say sorry to Nevada Athletic Commission and second to Vegas. I know this is not my best side. I’m a human being. “But I don’t understand how people can talk about how I jump on the cage. He talked about my religion, he talked about my country, he talked about my father. “He came to Brooklyn and he broke a bus, he almost killed a couple of people. What about this stuff? Why do people talk about me jumping over the cage? I don’t understand. An event which was billed as the biggest in the UFC’s history had an unsavoury end, and company president Dana White appeared shell-shocked by what had happened. 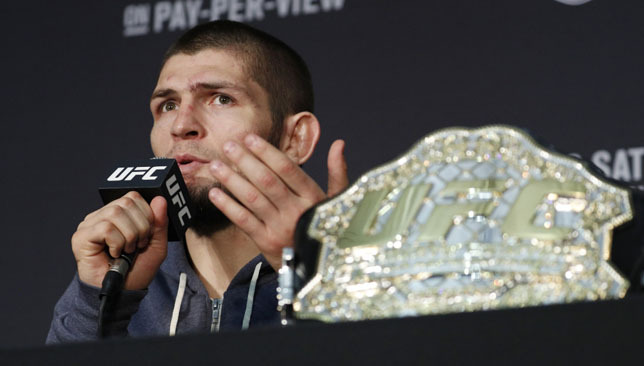 He revealed Nurmagomedov’s fight purse was being held back by the Nevada State Athletic Commission and that three potential members of the fighter’s camp had been arrested. However, White said that because McGregor did not want to take the matter further, the trio were later released. White said: “The Nevada State Athletic Commission pulled the footage from us and there’s an investigation going on. “They are withholding Khabib’s purse but not Conor’s. They looked at the footage and felt there was no need to withhold Conor’s. “The way it works is Conor is one of the guys attacked, Conor refused to press charges. The guys they had they released. Nurmagomedov knocked McGregor down in the second round with a thunderous haymaker and was ahead on all three of the judges’ scorecards when he emphatically finished the fight. Unfazed by the hostile reception he once again faced from a largely pro-McGregor crowd, Nurmagomedov took the Irishman down and locked in a rear-naked choke three minutes and four seconds into the penultimate round. White, though, refused to confirm whether Nurmagomedov would hold on to his 155lb crown and believes any sanctions handed down to the fighter by the NSAC could force his hand. White added: “It’s not 100 per cent certain. We’re regulated by the Nevada State Athletic Commission. They’re going to go after Khabib. The governor was here and he ran out of the building. Nurmagomedov was not presented with his belt and neither were there any interviews in the octagon, as is customary after a title fight. White explained he did not want to incite crowd trouble as the reason for not allowing Nurmagomedov to celebrate in the octagon. “I felt if we put the belt on him in the middle of the octagon, it was going to rain (with missiles),” White added. McGregor’s comeback was supposed to be a night of triumph for the UFC, which was expecting to set a new benchmark for pay-per-view figures, but this incident has cast a dark shadow on the sport. White said: “I’ve been doing this for 18 years and I couldn’t be more disappointed. “I should be in here bragging about the pay-per-view but I haven’t even looked at that or talked about it with anybody. “We should all be celebrating how when you put on the right event with the right guys at the right time, it works.